Grief, loneliness, and depression can affect anyone at any age. But addressing these emotions is especially important for seniors. 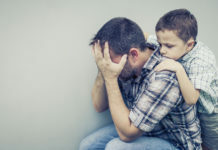 By understanding the blue feelings that may be looming in their life, you are able to properly help to combat the problem to ensure they are living their happiest life. Keep reading to learn the differences between grief, loneliness, and depression while also learning what you can do to combat the blue feelings in your loved one. We all experience loss throughout our lives. Whether it’s a pet passing away or a beloved family member, it can be difficult to cope with the grief that’s in your life. And as a senior, it’s more common to see the people around you, and even your spouse, pass away or struggle with debilitating conditions. And in times like these, it can be hard to find interest in normal activities leaving you feeling lonely and hopeless. Let’s discuss how you can determine if your loved one is struggling with grief. Grief can often be confused with loneliness and depression with similar symptoms that are easily interchangeable. But grief is unique in the fact that there is typically a certain event that causes the start of grief in someone’s life. But the way the person acts may be unique to their situation. Grief could mean that someone is angry, regretful, absent-minded, empty, or numb. They may have abnormal dreams or a disinterest to engage in the activities that they used to. But it is important to know that these feelings are normal. And it is okay to allow someone to grieve the loss of a loved one. Everyone grieves at his or her own pace. And it’s not something that can simply be cured with the snap of your fingers. With a loved one that is experiencing grief as a senior, the simplest thing you can do is be there for them and encourage them to express their feelings. If they are mad, let them be mad. And if they need someone to talk to, lend an ear and a kind heart. But keep in mind that it’s important to let the grieving process run its course. It may take some time but encourage them to perform normal daily activities. Do things that would typically put a smile on their face. And listen to what they need during this time. Loneliness can make you feel like you are isolated in a world that is bustling with people. And especially as an older age, loneliness can be crippling, causing you to never leave your home. Here’s some information to determine if your loved one is struggling with loneliness and how you can help combat it. There are a lot of symptoms that can help to determine if a senior is lonely. Starting with the obvious signs, you may notice that the senior in your life is spending more time alone with a loss of interest in attending social events. Or they may be gaining weight or losing sleep. When they feel alone or isolated, they are more likely to drown in their sorrows instead of fighting their way out of it. And that’s where you can come in. Helping to combat loneliness can be difficult especially when the senior just wants to spend time alone. But it is important to encourage them to open up about the way they are feeling. The more they are able to connect with someone on a personal level, the less alone they will feel. Additionally, it’s important to help them make new connections and friends that might be struggling with the same symptoms. This can be done by attending events or going out to meals with other people. Through this simple human contact, it will help to break them out of their normal routine that is promoting their loneliness. It is often said that loneliness and depression go hand in hand. When someone feels alone and isolated, it’s common to also feel the symptoms of depression. But the two are in fact different and should be treated differently. Let’s discuss what depression looks like, how you can identify it in a senior, and what you can do to help combat their emotions. Depression is a common mental illness that may affect people differently. But one of the most common symptoms that you may notice in the senior in your life is that they appear to be sad or “down”. This can often be confused with grief or loneliness, so it’s important to pick up on other symptoms that they may have as well. From oversleeping to lack of interest, depression can come in many forms. You may also notice guilt, irritability, physical changes, and changes in their energy levels. But it is also important to note that many cases of depression often go unnoticed because the person hides their symptoms when they are around other people. If you believe that the senior in your life could be depressed, the most important thing you can do is try to understand what is going on in their life and how they are truly feeling behind closed doors. When it comes to depression, it’s important to help establish a functional routine. By setting daily goals and creating a regular to-do list, it can help to establish a purpose in the senior’s life. It’s also important to promote regular exercise, healthy eating, and getting enough sleep. This includes also eliminating any possible depressants from their life, including alcohol. By living a healthier lifestyle, it will help to boost the mood and hormones that might be causing the depression. However, it is important to note that if you believe that the senior in your life is struggling with serious depression, it might be time to contact a doctor to see the other options that are available to help them through this tough time. Grief, loneliness, and depression may appear to be very similar when dealing with a loved one. But it is important to remember that each of these blue feelings is actually different in appearance, so how you approach them can make all the difference. If your loved one is struggling with long-term symptoms of any of these feelings, make sure that you contact a professional to see if additional help may be required. Craig Hammontree serves as the CEO for HealthMax 360. Craig oversees all operations and business activities to ensure they produce the desired results and are consistent with the overall strategy and mission. Before joining HealthMax 360, Craig led multiple teams to success in large fortune 500 companies. His family and spending time at the lake is how he spends his off time. If he can combine the two, that is his oasis.